In the sections below, we provide a brief overview of the process typically associated with the development of energy technologies. This is followed by descriptions of the publicly-funded initiatives that helped move gas extraction from unconventionals to commercialization. The development of advanced energy technologies commonly involves a down-selection or filtering process of technologies from a large portfolio of laboratory/bench-scale projects to a small portfolio of large-scale pilot projects, as portrayed in Figure 1.6 The process involves multiple steps because there is insufficient information generated at the laboratory/bench scale to confidently predict eventual commercial success. The rationale for government funding of technology development is to offset risk that private industry will not absorb all along the development pathway. In recent years, the U.S. Department of Energy (DOE) has adopted the Technology Readiness Level (TRL) concept to track the progress of technology development. The TRL approach is a measurement system that supports evaluation of the maturity of a particular technology based upon the scale, degree of system integration, and test environment in which the technology has been successfully demonstrated. TRL scores associated with different stages of technology development are also shown in Figure 1. Integration of these advancements was then required to complete the process. Government support of R&D starting in the 1970s, drove down costs of unconventional extraction and led to the economic benefits we see associated with natural gas today. Significant milestones in the technology development pathway are summarized in Figure 2 and described in additional detail in the sections below. The TRL approach had not been implemented at DOE at that time, so the TRL scores shown in Figure 2 and in the sections below represent approximations of levels for each part of the development process. Information regarding each of these components is provided below. Microseismic imaging allows well operators to detect and measure faint signals at the base of deep wells to generate a map of the fractures in a particular shale or sandstone formation. The ability to generate this type of map leads to lower drilling risks, higher well productivity, and lower overall costs.16 Advances in microseismic mapping were made at several national laboratories based on low TRL level (2 to 3) R&D associated with geothermal, mining, and military applications. Open access to cutting-edge computing facilities at the national laboratories played a significant role in advancing the technology. Federal government basic research was critical to technology advancement, and government participation in technology demonstrations lowered industry exploration risks and demonstrated the market and emissions reduction potential of unconventional gas. The partnership extended to funding as well. Estimates of funding to support the technology development and commercialization efforts are summarized in Figure 3. As noted, early funding for work at low TRL levels was dominated by direct DOE expenditures. 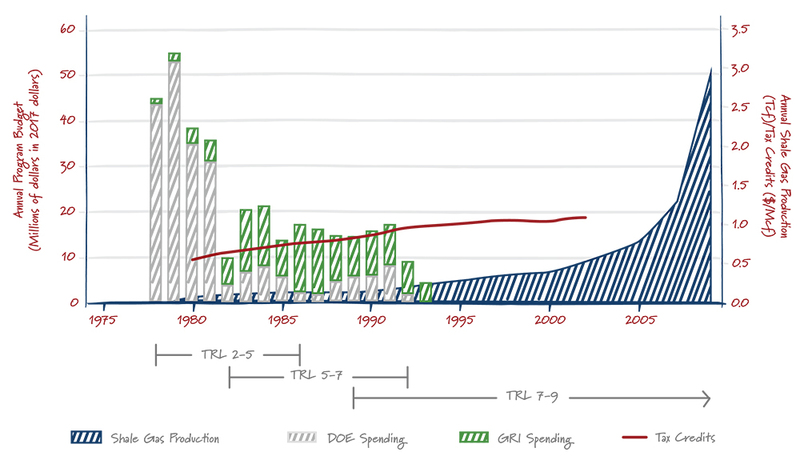 As TRLs increased to the TRL 4 – 7 range, the GRI public-private partnership became the dominant source of funding. Data regarding direct industry funding are not available, but gas production provides a good surrogate for spending by industry. As noted, gas production increases rapidly as TRLs increase beyond TRL 7, at which point DOE and GRI funding ends and industry moves the technology into full commercial operation. While the main focus of Figure 3 is the financial commitment associated with development of technologies for gas extraction from unconventional sources, the time required for ultimate commercialization also provides a significant message. Global events and markets hinted that something needed to be done regarding natural gas supplies in the early 1970s. This prompted initiation of R&D in the late 1970s that led to successful commercialization in the 2000s. Making it through such a long process required vision and persistence on the part of both government policy makers and scientists as well as commercial interests such as George Mitchell. Because the process took so long, there were many opportunities to abandon the effort along the way. In the end, their vision and persistence were proven worthwhile. As noted above, shale gas provides approximately $100 billion of benefit to consumers each year. Even if the cost estimates included in Figure 3 are low by a factor of two, the expenditures were clearly an excellent investment in terms of both time and money. The suite of Fracturing technologies have been instrumental in propelling the United States to become the world’s top producer of oil and natural gas. Ron Munson is a principal at Cogentiv Solutions, a consulting firm specializing in energy and environmental management. Mr. Munson was a former technology manager at the Global CCS Institute and a Senior Engineer contracting to the National Energy Technology Laboratory. Justin Ong is a program director at ClearPath, a DC-based non-profit organization that specializes in clean energy policies that develop and demonstrate breakthrough technologies.